MB Business Capital, a division of MB Financial Bank, N.A., announced record growth for the month of June 2017 by funding nine new relationships. "We were able to provide record breaking capital to new customers while providing quality customer service. Our backlog looks very strong and we expect continued record growth for 2017,” says Michael Sharkey, President of MB Business Capital. MB Business Capital, a division of MB Financial Bank, N.A., announced it has experienced record growth so far in 2017. 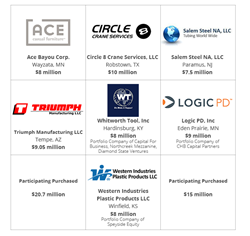 In June 2017 MB Business Capital funded nine new relationships contributing to the record growth. The growth was achieved by executing on a plan implemented in 2016 to expand MB Business Capital’s efforts in both the United States and Canada. “The MB Business Capital team should be very proud of the work they have accomplished. We were able to provide record breaking capital to new customers while providing quality customer service. Our backlog looks very strong and we expect continued record growth for 2017,” says Michael Sharkey, President of MB Business Capital.